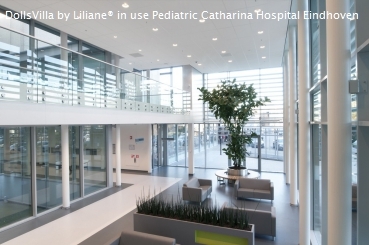 "The DollsVilla by Liliane® fits perfectly with the Juliana's Planetree care concept, a child-oriented care. Also atttention for the mental, social and emotional needs of children in addition to their illness or disability." May van Gijn-Huyssen van Kattendijke | Pediatric Physical Therapist HagaZiekenhuis The Hague | Juliana Children’s Hospital. The topclinic HAGA Hospital The Hague is the only non-academic hospital in the Netherlands with its own children's hospital. The Juliana Children's Hospital, founded in 1885, has been part of the HAGA Hospital since 2004. More than 50,000 children visit the outpatient clinic annually. 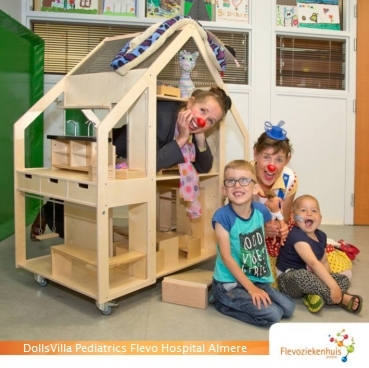 "We use the DollsVilla by Liliane® in the children's department of our hospital, in the playroom and as a professional commitment for observation purposes." Lianne Stuurman en Hanneke Dane, members of the Pedogogic Pediatric team of the Groene Hart Hospital Gouda. The house is not only for playing, but also for medical and psychological purposes, explains a spokesperson of the hospital. "Physicians can observe children while they play in the villa. For example, if a child has a painful arm, doctors can watch the movements of the child using his or her arm in the house." That is why not only the villa is large, but also the dolls and cars in the house. "Children attach themselves more quickly to something life-sized, and it is also easier to handle, allowing doctors to observe the child picks something up," the hospital said. Today I had a working visit to the Pediatric department of the VUmc hospital and spoke with Ine de Jonge, nursing manager and prof. Hans Goudoever, head of the department. So impressed by their warmth and empathy, their high motivation and the attention for details in their work for sick children. 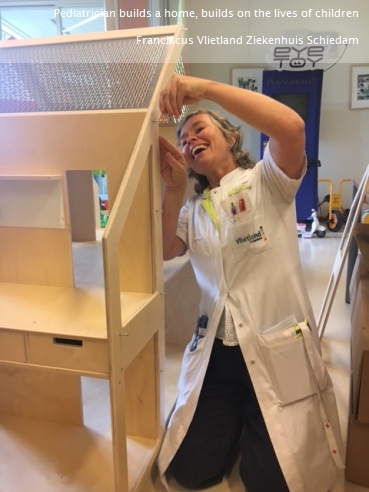 I met great enthusiasm about the value of the DollsVilla by Liliane® in the play-area near the reception of Pediatrics VUmc. 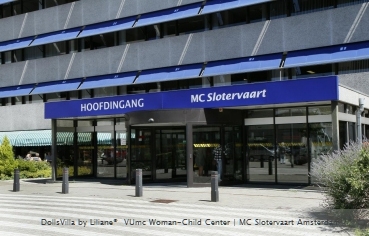 A DollsVilla by Liliane® will also be part of the new policlinic VUmc Woman-Child Center, located at the Medical Center MC Slotervaart Amsterdam. The disciplines of pediatrics, gynecology and obstetrics work together. 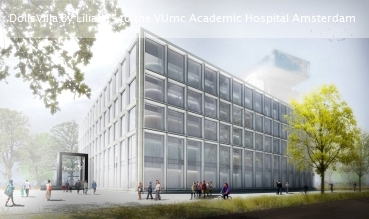 In the future this will be done together with the Academical Medical Center AMC Amsterdam. 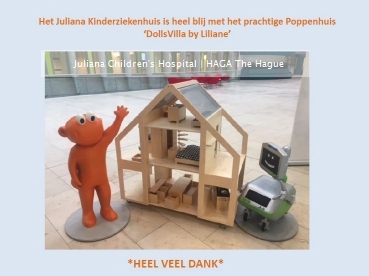 "The beautiful DollsVilla by Liliane® will be used in our playroom for sick children in the children's department." Annelies Walrave, pediatrician and business leader of the department of Pediatrics MC Zuiderzee Lelystad The Netherlands. "The DollsVilla by Liliane® fits perfectly in our playroom and will be shared with our Child Psychology department for role-playing during a consultation." Linda Visser, Pedagogical assistant of the department Pediatrics of the Waterland Hospital Purmerend The Netherlands. 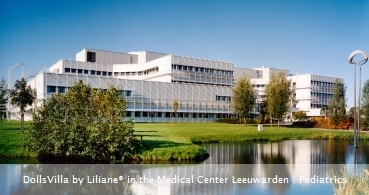 Medical examination 2017 of the DollsVilla by Liliane® after intensive use since 2002 in a GP practice in the south of the Netherlands | Maastricht. 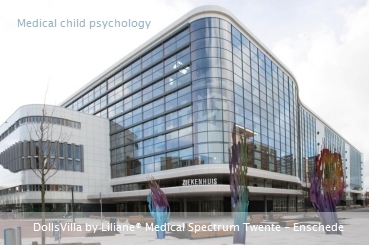 DollsVilla by Liliane® in use by the professionals of the department Medical child psychology of the Medical Spectrum Twente - Enschede. 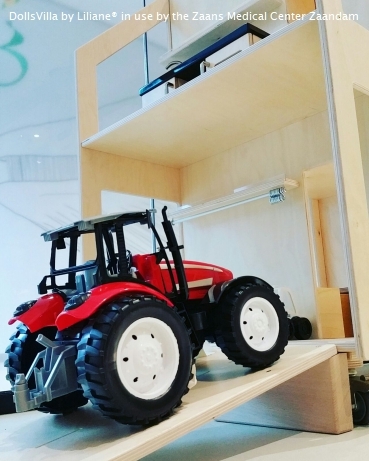 "After internal consultation [pedagogical staff, pediatrics and psychology] we decided to use the DollsVilla also for diagnostics and to place it in the department of Medical child psychology." - dr. Lisette Wegdam | Pediatrician and Medical Manager Pediatrics. 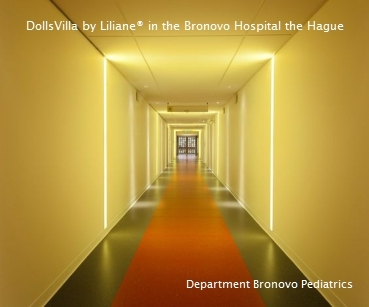 In the meantime, many Dutch [children's] hospitals - their departments pediatrics, psychiatry and psychology - use the DollsVilla by Liliane® especially for the observation of the child and the parent-child interaction. And for the processing of hospitalization and any traumatic experiences which are related to the hospital. The Zaans Medical Center in Zaandam is the newest hospital that starts. 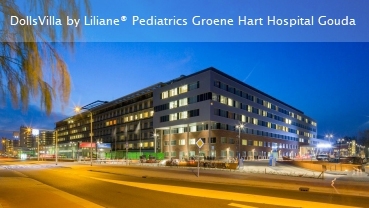 Daniëlle Blom, pediatrician Zaans Medical Center: "We are very happy with the DollsVilla by Liliane®. Children love the villa enormously and it is a wonderful addition to the design of our playroom in the new hospital." The DollsVilla by Liliane® is going to support the work of dr. Cara VanWormer-Hartman, Illinois US. VanWormer is a doctor of chiropractic, diplomate of the American Chiropractic Board of Diagnosis and Internal Disorders and founder of the Therapeutic Health Associates. 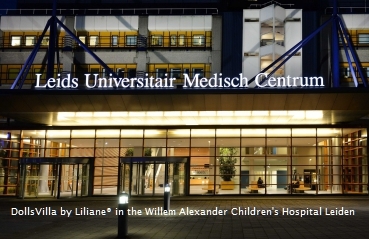 "I have shown your beautiful project 'DollsVilla by Liliane®' to the pediatricians, nurses and pedagogical staff of the Franciscus Vlietland in Schiedam and everyone is very excited." 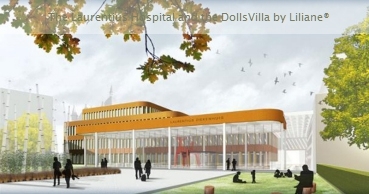 "We would love to use the DollsVilla within our department Pediatrics. The educational staff should often prepare children for health surveys or medical operations, and they can make good use of the DollsVilla. Even the children in the department will be very happy with this beautiful DollsVilla by Liliane®". Daphne Janssen | Pediatrician Franciscus Vlietland Hospital Schiedam The Netherlands. 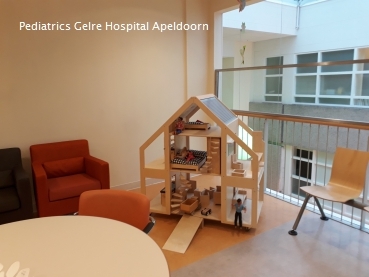 The pedagogical team of the Mother & Child Center of the Laurentius Hospital in the south of the Netherlands is happy with the arrival of the DollsVilla by Liliane®. 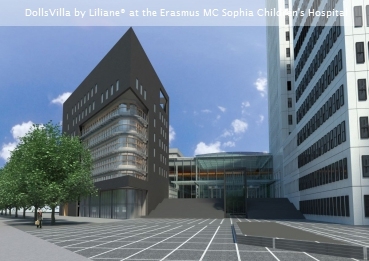 The famous Erasmus MC-Sophia Children's Hospital is the new owner of a DollsVilla by Liliane®. The hospital uses the villa in her department of Pediatric Oncology and Hematology. Manager Annemarie Emmens: "We are very pleased with the DollsVilla." Sophia is the oldest and largest children's hospital in the Netherlands. Originated in 1863 and from 1971 part of the Erasmus Medical Center. Sophia has eight operating rooms and one intervention room. Prof. dr. Edmond Rings is the head of Pediatrics. 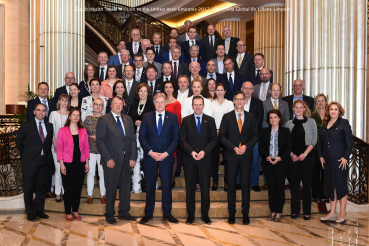 Hans van Goudoever | Professor of Pediatrics VUmc | Director Emma Children's Hospital AMC | Division chair Women&Children AMC | Amsterdam The Netherlands. The team of the pedagogical staff of the Department of Pediatrics and Neonatology at the Flevo Hospital in Almere happy² with DollsVilla by Liliane®. 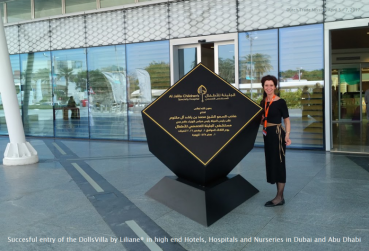 How the DollsVilla can contribute to a certain well-being of children in a hospital environment. #honorable mission. "On Tuesday June 20th, the children's department received a beautiful gift: A XL dollhouse on wheels, thanks to the technical service. The DollsVilla by Liliane® has got a nice spot in the playroom. The fun is that the hug and / or doll of the children can continue to eat and sleep in the DollsVilla! The furniture is just real." "For the educational staff, the DollsVilla by Liliane® is a great way to get in touch with children. The house is suitable for both boys and girls because the DollsVilla is wooden and there is a garage attached. The pedagogues find it a big asset for the children's department!". 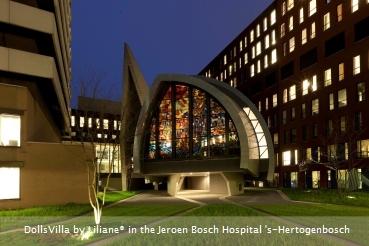 DollsVilla by Liliane® to the outpatient clinic of the department Pediatrics of the Jeroen Bosch Hospital 's-Hertogenbosch The Netherlands. 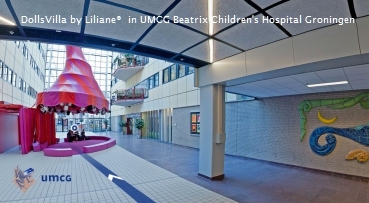 DollsVilla by Liliane® to the department Pediatrics of the Medical Center Leeuwarden The Netherlands. 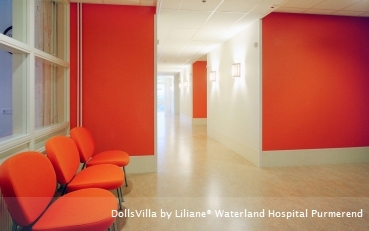 DollsVilla by Liliane® to the department Pediatrics of the Isala Hospital Zwolle The Netherlands. 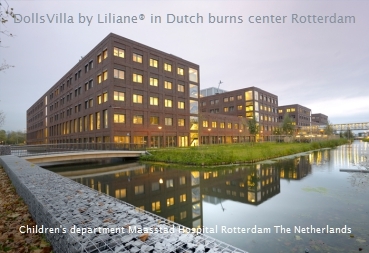 DollsVilla by Liliane® to the department Pediatrics of the new Mother & Child Center of the Admiraal De Ruyter Hospital Goes The Netherlands. Giving the children’s children a sustainable house with lots of light and space to live in will contribute to the happiness, wellbeing and resilience of their young parents. 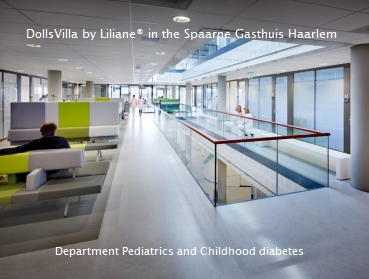 DollsVilla by Liliane® to the Spaarne Gasthuis Haarlem, department Pediatrics and Childhood diabetes. 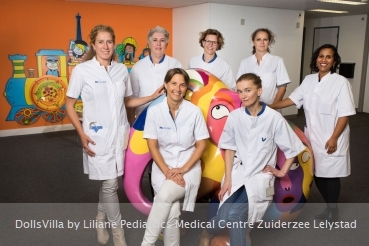 The team of the pedagogical staff of the Department of Pediatrics and Neonatology at the Flevo Hospital in Almere happy² with DollsVilla by Liliane®. 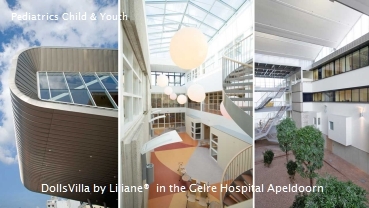 The department Pediatrics of the Gelre Hospital Zutphen look forward to the arrival of the DollsVilla by Liliane®, next Thursday. Pediatricians, health psychologists and pedagogues will primarily use the villa to observe children in their own world and words. "The DollsVilla looks so great! The house has arrived and is already intensively in use. Her position is a prominent place at our department's entrance. The DollsVilla will also be moved for playtherapy to the playroom at our outpatient clinic. Super handy with wheels underneath! ". Yvette van Klingeren, Head Child & Youth and Neonatology of the Gelre Hospital Apeldoorn | Pediatrics. 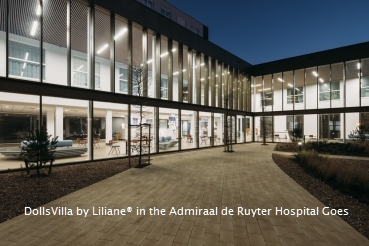 The Amalia Children’s Hospital of the Radboud University Medical Centre in Nijmegen welcomes the DollsVilla by Liliane®. The villa will be deployed by the team of pedagogical care. 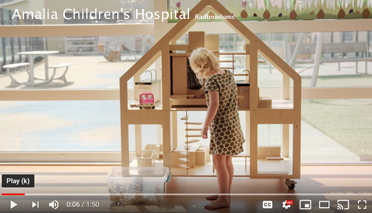 Every year approximately 22,000 children between 0 and 18 years of age are treated in the academic Radboud UMC Amalia Children's Hospital. 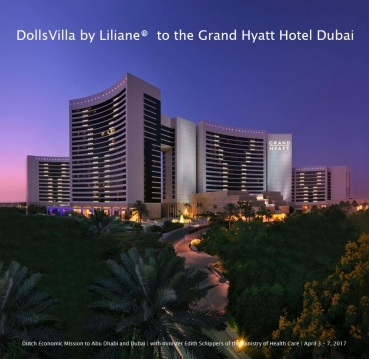 "Our staff Pedagogics will, among other things, use the DollsVilla by Liliane® to prepare children through role play for an surgical intervention, and for the recovery period [at home]." Lisette Beugelsdijk | Care coordinator of the Mother and Child Centre | Bronovo Hospital The Hague | Department Pediatrics. "The villa will be used in the new playroom of the Pedagogical Staff. Child psychologists use the DollsVilla for play therapy. Children admitted to our hospital can visit the playroom twice on a daily basis. The DollsVilla will be driven to the children who are bound to their own nursing room!". Karin de Witte | Head of the Pedagogical Staff of the Willem Alexander Children's Hospital | LUMC Leiden. "The DollsVilla looks so great! Of course we would like to make space for the villa." Yvette van Klingeren, Head Child & Youth and Neonatology of the Gelre Hospital Apeldoorn | Pediatrics. Children's special outpatient clinics, among others: Growth and development • IMH Infant Mental Health • Children's nursing • Child allergy • Children's cardiology • Children's eating • Children's lung • Neonatology • Child and Youth • Psychology Child and Youth • Transition. 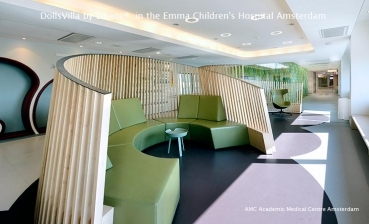 The DollsVilla by Liliane® will support the work of psychologists and social workers of the Psychosocial Department of Emma Children's Hospital [± 30,000 consultations outpatient clinic , ± 6,000 hospitalizations and ± 4,000 hospitalizations without overnight stay ]. They help prevent or reduce the adverse effects of illness and medical treatment on the mental wellbeing of a child and the parents. Even when physical complaints occur that are associated with the child's social-emotional problems, they can be enabled. 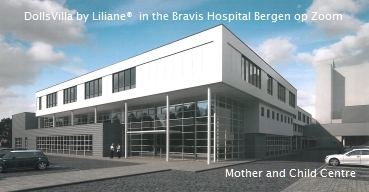 A DollsVilla by Liliane® leading in the brandnew Mother and Child Centre of the Bravis Hospital, with locations in Roosendaal and Bergen op Zoom | The Netherlands. J.G.E. [Janine] Dijkhuis-Waucomont | Department manager nursing department and outpatient clinic Pediatrics Catharina Hospital Eindhoven The Netherlands. "We are very happy with the DollsVilla by Liliane®. Both child psychiatry, child psychology, pedagogical staff and pediatricians are extremely pleased and sure of the possibility of finding a good destination for diagnosis and treatment." 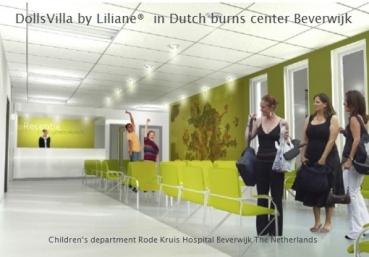 The children's departments of the burns centers of two Dutch hospitals feature the DollsVilla by Liliane®. Children play with the villa in the playrooms. Professional care providers of the Rode Kruis Hospital Beverwijk and the Maasstad Hospital Rotterdam use the DollsVilla to make easily contact with the children. Maasstad Hosptial Rotterdam: "Beautiful project. The functional DollsVilla is a very valuable addition to what we can offer our patients." Annemiek van Dijke, Associate professor at VU University | Clinical psychologist / clinical neuropsychologist / researcher at Academisch Medisch Centrum Amsterdam [AMC].